Wilhelm Coetzee’s path to Durbanville Hills, where he was appointed red winemaker in 2008, was an unconventional one. He originally studied analytical chemistry at the Cape Technikon, joining Denel upon graduation as analytical chemist. The attraction of winemaking however, proved too strong and Wilhelm soon decided to take up a fresh course. He completed a Bachelor of Science degree at the University of Stellenbosch, specialising in viticulture and oenology. In 2000, he was appointed cellar master and winemaker at Flagstone Winery, where he worked alongside Bruce Jack. He played a pivotal role in building Flagstone’s reputation locally and abroad, with the winery consistently earning acclaim at major competitions. When the winery was sold in 2008 to Constellation Brands, then the world’s largest wine company, Wilhelm opted to move. 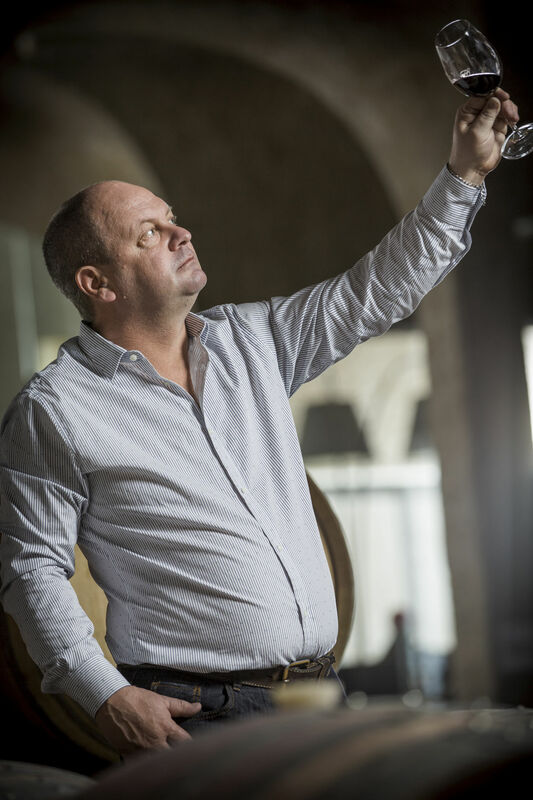 At Durbanville Hills, he found a new home, working alongside cellar master Martin Moore and white winemaker Kobus Gerber. The winery he joined was established in the 1990s, with its first harvest just prior to the new millennium. Wine has however been made n the Durbanville area since the end of the 17thcentury. In addition to its white wines, the red wines that are under Wilhelm’s care include the Durbanville Hills Cabernet Sauvignon, Shiraz and Pinotage. In addition to the obvious responsibilities in the cellar, Wilhelm strives to be actively involved in the vineyards throughout the growing and ripening season – where the wines begin their journey. Nine leading vineyard owners in the Durbanville district joined forces with Distell to create Durbanville Hills with the aim of promoting the regional individuality of this prime wine-growing area. It is here that Durbanville Wines have their provenance. Wilhelm relaxes through cooking and spending time outdoors, walking and gardening.